Hey guys, so I’m here with ‘From the Horse’s mouth’. I will ask various people a couple of questions about the different states in the country that they live or have lived in (They choose which they want to speak on). They’ll give advice on living there, and you can hear what they think about where they are, what they like or don’t like. Best part? People living in the same state will probably have different answers to certain questions so this way, you know what each state has to offer if you want to go there. I’ll do my best to make sure that we speak to a wide range of people from different backgrounds. Lets get into it shall we? Unravelling Nigeria: What’s Abuja like? Mstaxx: Using one word, I would describe Abuja as chilled. It’s really not too stressful, but you need to have a bit of money to play in the big leagues. Hahahahaha (that isn’t really funny). Unravelling Nigeria: What’s your favourite experience in Abuja? Unravelling Nigeria: What are your top recommendations of things to do or see there? Mstaxx: Abuja is set up in a way whereby bars and lounges key. I particularly enjoy outside/garden bars so I would always recommend traffic at the Missouri hotel or the bar right in front of The Bank (club). Mstaxx: Woks & Koi, Johnny rockets for burgers, Blue Cabana and although I haven’t personally been there, I hear the food at beer barn is good. Unravelling Nigeria: If someone was there for a day, what should they do or where should they go? Mstaxx: Make sure someone in your crew has a CAR!! 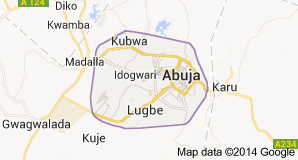 Unravelling Nigeria: So do you like living in Abuja? Our tip on the most important information from this interview is, you must be mobile in Abuja, or you could just try out their public transportation. I don’t really have a lot of information on that. I hear taxis are also another way of getting around, so you can always get a taxi number and make that person your means of transport while you are there. Image gotten from google maps.